The Moron Test (formerly known as the Idiot Test) by DistinctDev is an entertaining app that tests your ability to accurately following instructions. In the fast-paced world that we live in, we often speed through the instructions and infer a lot about the answer from what we see. This test requires you to read instructions completely, remember several steps, and complete them flawlessly. If you make a single mistake, you fail the test and have to start over. The test is not hard. A child could follow the instructions. The question is, can you? For me, it took a lot more concentration and attempts to complete the test than I like to admit. The only problem with the app is that the test never changes. Once you have figured out all of the questions, the app loses its entertainment value for you. I think the real fun comes in watching friends, co-workers, or family members try to complete the test. The Moron Test is a humerus way to kill time. 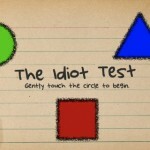 The Moron Test is $0.99 in the iTunes App Store.